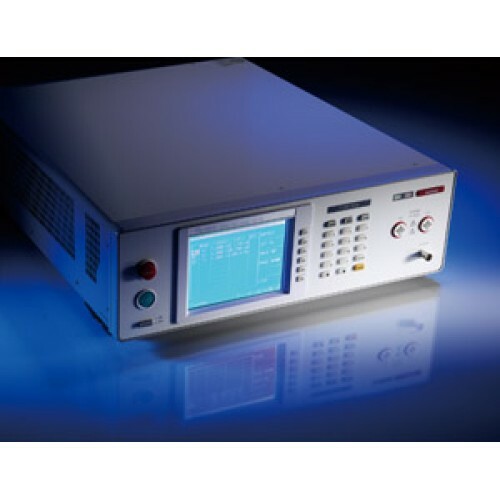 Motor: The 19055 Series Hipot Analyzers with 500VA output rating can be used to test and analyze the withstand voltage of high power and leakage current for the products like motor stators and rotors with high parasitic capacitance. Corona detection can be used for turn-to-turn or turn-to-ground test to avoid winding insulation failure from corona discharge. Transformer: When using a power transformer under the normal voltage, a primary side corona discharge could cause the adjacent components to be damaged if occurred. Thus, the function of Corona Discharge Detection (CDD) of 19055-C can be used to detect if there is any corona discharge occurred to improve the product quality. The 19055-C has not only the AC/DC/IR tests but also a new measurement technology - Corona Discharge Detection (CDD) that can detect the following via the Discharge Level Analysis (DLA). For convenience use, Chroma 19055 has large LCD screen for operation and judgment. In addition, the GFi human protection circuit and Floating safety output prevent the operators from electrical hazard. What does dielectric withstand fail mean? Most of the regulations state: "During the test, no flashover or breakdown shall occur." Nowadays, the study of insulation failure and electrical discharge has been very important in insulation materials and high voltage components. Because electrical discharge and insulation capability are interrelated, discharge level detection is not only a safety issue but also crucial to product quality. Electrical discharge can be categorized into 3 groups which are Corona discharge, Glow discharge and Arc discharge according to the material discharge characteristic. Corona Discharge: When two electrodes withstand higher voltage, the electrical field becomes stronger. If the strength of electrical eld produced by the current is greater than the ionization potential of air, there will be temporary ionization of air on the surface of insulation material, and visible light and temperature rise around the discharge area. Long term corona discharge and temperature rising may cause Qualitative Change of material, insulation deterioration, and nally insulation failure. Figure 1 shows the discharge of corona. Corona discharge is a high frequency phenomenon which can be detected by high frequency measurement. Glow Discharge and Arc Discharge: When high voltage applies to an insulation material, its inner and surface part might have electrical discharge. High voltage might make the insulation material lose its insulation capability and cause transient or discontinuous discharge which could form a carbonized conductive path and lead to product damage. Flashover/Arc discharge cannot be detected by monitoring leakage current only. The change rates of test voltage or leakage current are monitored to screen out the defected products. Flashover detection is one of the most indispensable test items for electrical safety test. For different electrical discharge characteristics, Chroma 19055 Series provides discharge level analysis including Corona discharge detection (19055-C only), ARC/Flashover detection and breakdown detection. These functions are the best tools for research and quality assurance. OSC function can check if there is any Open (bad connection) or Short (DUT short circuited) occurred during test. If a DUT is open circuit during test, the unit might be misjudged as a good one. If a DUT has short circuit, OSC function can lter it out to diminish the damage to xture and save the test cost. In general, products under Hi-pot test have capacitance (CX). CX could be tens of pF to several μF in normal condition. When the circuit connection is interrupted, a small capacitance (Cc in Figure 3.2) will be formed on the broken interface that is usually lower than 10pF. It makes the entire capacitance of the product lower than normal value. The capacitance of a product may be higher than normal when the product is short-circuited or near short circuit. Thus the high/low limit of capacitance variation can be used to identify the short circuit problem. Dielectric withstanding voltage of passive component depends on the insulation material and manufacturing processes. To improve insulation ability, discharge level should be dened and analyzed including Corona discharge, Flashover and Breakdown level. Chroma 19055 has added Discharge Level Analysis mode (DLA) which let users to program start voltage, ramp time, steps, limits and so on for analysis. Discharge Level Analysis (DLA) has three levels of judgment: Corona limit, ARC/Flashover limit and high limit for breakdown. DLA mode will show the withstanding voltage depending on the different level of limit set. The limits are Corona discharge Start Voltage (CSV), Flashover Start Voltage (FSV), and Breakdown Voltage (BDV). R&D and QC personnel are able to improve the insulation by data collection and analysis of discharge voltage. For operator's safety when manipulating the tester, Chroma has developed a brand new technology - Floating output circuit that complies with EN50191 Equipment Safety Standard. When in Floating output state, no matter which Hipot test terminal the operator touches, the earth leakage current is lower than 3.5mA and the operator won't be injured by the electricity. erence iH (i1-i2) between i1 and i2 detected by current meters A1 and A2 is too high, the GFI device will cut off the power immediately to protect the human body from electrical shock. It is not only compliant to the safety standards but also a safeguard for test personnel.